Today, President Serzh Sargsyan met with President of the Republic of India Shri Ram Nath Kovind in New Delhi. Thankful for the high-level welcome shown to the Armenian delegation in India, President Sargsyan once again congratulated Ram Nath Kovind on his being elected as President of India, wishing him ever new achievements in his responsible mission aimed at ensuring India’s prosperity and the well-being of the people of India. Serzh Sargsyan expressed confidence that the meeting with President Kovind would give new impetus to the strengthening of friendship between the Armenian and Indian peoples and the further development of relations between the two countries. The President of Armenia described the World Food Forum and the concurrent exhibition in India as quite impressive, noting that the official delegation of Armenia had attended the opening of the exhibition. 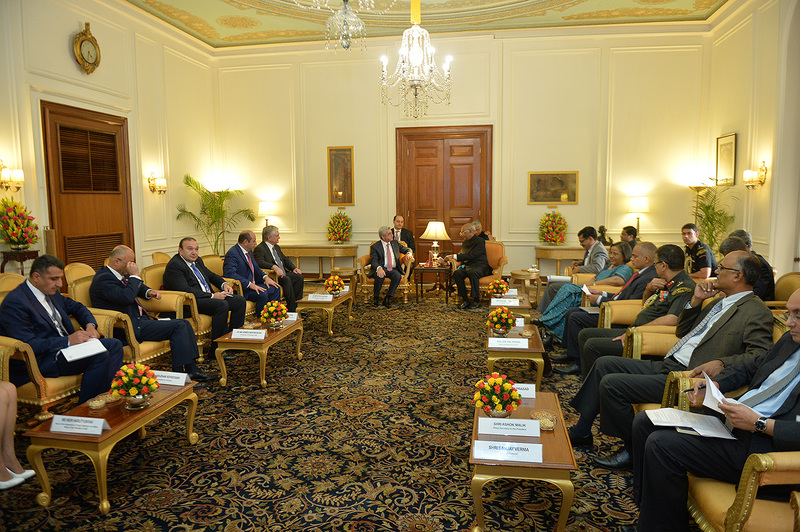 President Sargsyan spoke with satisfaction about the productive meetings held with Prime Minister Modi and Vice President Naidu on the sidelines of his working visit to India, during which ways of strengthening and deepening the Armenian-Indian friendly relations at the inter-parliamentary and intergovernmental levels were discussed. Touching upon the Armenian-Indian centuries-old friendship, Serzh Sargsyan pointed out that there are numerous references to close relations between the two nations in the works of historians. Many sources claim that Armenian and Indian merchants established strong ties of cooperation as early as in the first millennium. President Sargsyan said it was not accidental that a considerable number of Armenian communities had been formed in a number of major Indian cities since the 16th century, which used to play an active role in India’s social, political, economic and cultural life. Evoking the Armenian community in Calcutta alone, Serzh Sargsyan noted that in the 17-19th centuries it was very viable and played a key social and political role not only in India, but also in the public life of all Armenians. In that context, President Sargsyan made a point of Azdarar, the first Armenian printed magazine published in Madras as early as in 1794, as well as a book authored by Hakob Shahamiryan, Vorokait Parats (Snare of Glory), that was published in 1773, and which outlined the future Constitution of the independent Armenian State. President Serzh Sargsyan thanked the President and the people of India for their thoughtfulness of the Armenian cultural heritage in India. Noting that tomorrow he was going to visit Taj Mahal, one of the best sights of India in Agra, the President said to be pleased with the fact that Armenian builders, too, participated in the construction of this magnificent monument. Serzh Sargsyan noted with satisfaction that over the past 25 years since the establishment of diplomatic relations, Armenia and India have managed to translate our peoples’ deeply rooted friendship into strong bonds of interstate partnership. The President thanked his counterpart for extending congratulations on this remarkable jubilee and expressed the hope that top-level meetings might help tap the huge potential of cooperation between the two nations and outline new vectors of bilateral relations. 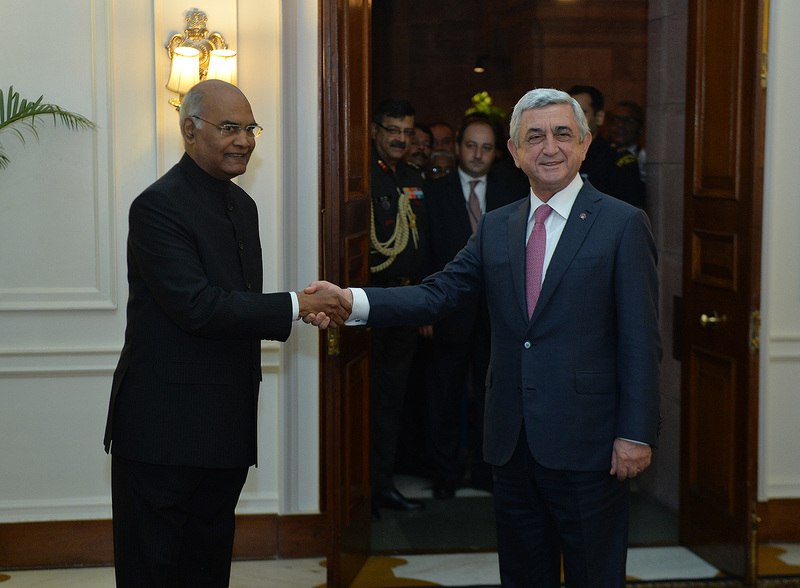 In turn, the President of India congratulated his counterpart on steering Armenia successfully from the presidential form of government to the parliamentary form, as well as on the victory of Serzh Sargsyan’s Republic Party in the latest general elections, wishing them every success. The interlocutors also touched upon regional issues and challenges, including the Nagorno-Karabakh conflict settlement process. President Ram Nath Kovind reaffirmed his country’s position that conflicts should be settled peacefully through dialogue, and went on to underscore that India supports the mediation efforts of the OSCE Minsk Group Co-Chairs.